As part of my good resolutions for 2019 I decided to further reduce my use of social networks which take my precious time away. Banning Facebook during the month of January was my first step to achieve my objectives. To resist the temptation I logged out from all my devices to make it more difficult to access Facebook. In 2018 I also drastically reduced the number of notifications to avoid those temptations. It seems however that Facebook wants me back and it uses all kinds of triggers to make me click. Today’s article is the story of Facebook’s hidden strategy to get me back. It offers me the opportunity to dig into the subject of habit formation and to point to an interesting functionality in iOS 12 to actually see how many daily notifications you get. In my opinion these emails follow a phishing technique where a reward is presented to the recipient in the hope that he will take action. 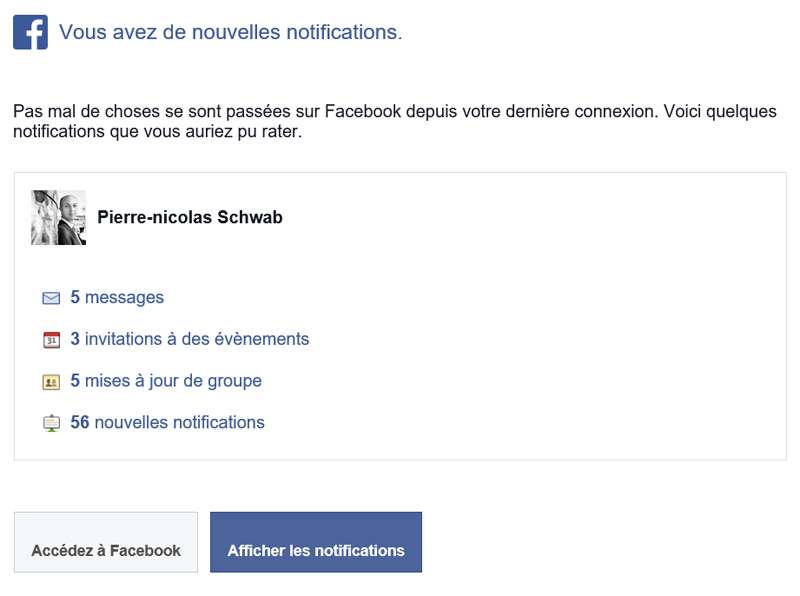 While scamers use phishing techniques in association with money (“claim your prize”, “you jost won”), Facebook has a different kind of currency to offer: notifications. Facebook leverages the Fear-Of-Missing-Out (FOMO) to make you addicted. On-app and in-app notifications are one of the many triggers used to create and nurture habits that enslave us. ‘Dual process’ models portray behavior as arising through two parallel processing systems: deliberative action arises from the ‘reflective system’, which regulates action using conscious weighing of the perceived pros and cons of action, whereas habitual action arises via an ‘impulsive system’ whereby cues activate associative links that generate action with little conscious monitoring. First, their formation requires repetition. Second, once formed, habit directs behavior automatically, i.e., habitual behaviors can proceed with minimal conscious monitoring. Third, habitual behaviors are context‐dependent; only the situational cues with which the behavior is associated can activate the habit impulse. Isn’t it easy to apply this description to notifications ? We get dozens of notifications every day (repetition) that direct our behavior automatically in a given context (when using the smartphone). These notifications are not predictable in terms of timing, hence making it impossible for our brain to proactively switching off from considering this notificaction. I’m sure you’ll have noticed it takes a great deal of efforts to resist the temptation of looking at your smartphone when your brain is excited by an incoming cue (be it visual like an on-app notifications or auditive like the sound of an incoming message). How many notifications do YOU get daily ? I recently discovered a new functionnality of iOS that gives you an overview of how many notifications you get on a daily basis. The average daily number of notifications is a much debatted figure. Until recently it had to be evaluated indirectly. 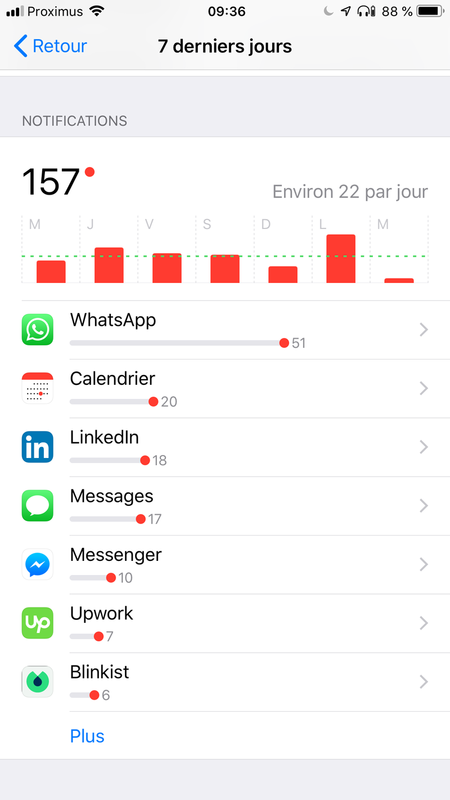 With iOS the user has finally the possibility to see how much distraction notifications are creating in his / her life. To take the test, go to your settings menu, then to “screen time” and click on the graph. Scroll down and you’ll see the number of notifications you got in the last 24 hours or in the last 7 days. As you can see from the screenshot below, I’m getting 22 notifications on average, mostly messages (Whatsapp, sms, Messenger). Now it’s your turn to take action. Use this tool in iOS 12 to first get an overview of how many cues you get and then to adjust the leve of disturance. My advice : try to mute all non-messaging notifications.